Our client, Blu and White Homes, has done it again. They’ve created an amazing environment for us to stage. This time, a modern interpretation of classic Spanish architecture and design. We jumped at the chance to stage this beauty and we’re so glad we did. In the living room, the Haven sofa has just the depth and natural linen coziness we needed for this larger-than-average room. A seagrass rug grounds the space, while swivel chairs in a subtle pattern stand up well to the sofa’s visual weight. Photos by Christopher Lee and Adam Taylor. We love a large square cocktail table for impact in large rooms. Here we’ve styled it with oversized coffee table books and a brass knot. A fiddle leaf fig and a Chinese altar table fill out the opposite wall. A view from the backyard reveals the indoor-outdoor living this home offers. The living room literally opens up to the outside and beckons easy-going summer life to happen. A side patio with lounge furniture features an outdoor fireplace. A sculptural burnished brass lamp atop a vintage Chinese altar table with a casual stack of coffee table books below a large mirror reflecting another mirror over the fireplace, reflecting back on itself. So meta. A scene from the master bedroom looking into the master bath, featuring an ARTOBrick floor tile. We kept the staging simple, elegant and restrained, with neutral tones and fresh whites. Master bath staging is light and airy, with a spa-like feel. Plenty of bath sponges, makeup brushes and lotions, with a Turkish towel or two, make your bath a retreat from the stresses of modern life. Loving this tub and everything around it! Spanish made modern for a new generation to appreciate. 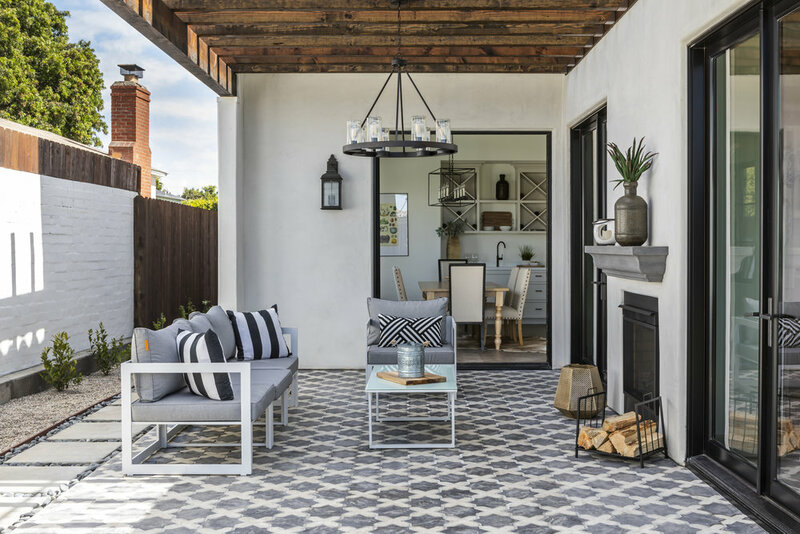 The home’s ample side patio invites with more ARTOBrick on the floor and a cozy fireplace for those brisk coastal evenings. A Modway outdoor sectional and chairs bring the modern influence. We styled the space with B&W awning stripe pillows to play off the patterned tile. When touring this home with our developer client, Blu and White Homes, they specifically asked for a Serena & Lily look in the staging. In other words, fresh, traditional, beachy and with an East Coast vibe. Oh, and lots and lots of blue and white, the developers’ signature color palette! Armed with catalogs, Pinterest and a showroom visit — combined with an already developed devotion to the S & L brand — we began to plan the staging. White linen English roll-arm sofa: Check. Woven cocktail table: Check. Fresh neutral swivel chairs in a dot-dash stripe: Check. Our client already had the Serena & Lily counter stools and dining chairs. So, it was off to the races! All photography by Christopher Lee. Light coastal wood floors and white cabinetry show off the French cafe lines of the iconic Riviera chair and counter stool. 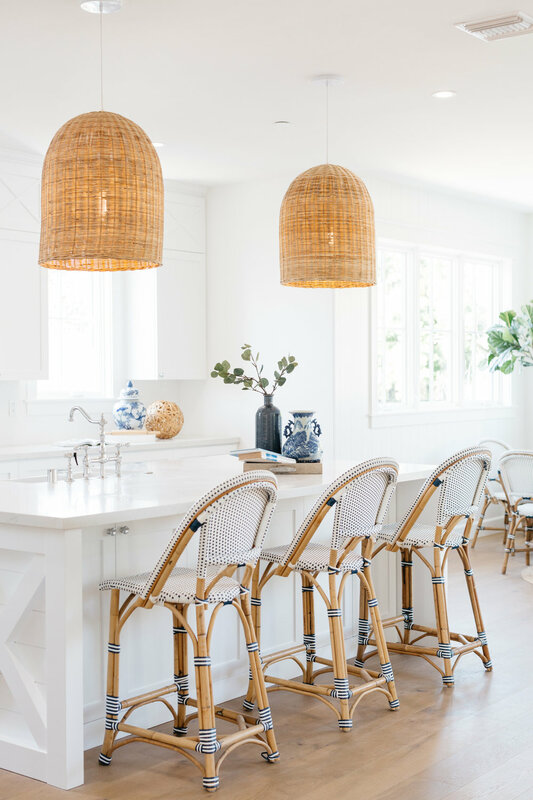 And S & L’s signature basket pendant lights over the kitchen island convey a laid-back take on beach living, perfect for a California family’s lifestyle. Blue and white striped and solid pillows, a soft blue Persian rug and a few books and shells sum up this nod to the nautical. But because it’s Southern California, we just had to throw in a fiddle leaf fig. We reached into our vast supply of blue and white Chinese ginger jars and porcelain plates to accent the living room’s casual charm. It’s our way of bringing in the trad feels. But a bamboo side table and modern beach photo take it down a notch to just the right level. If there’s a better leaf out there for maximum impact than the Monstera, please raise your hand, er, stem. See, we didn’t think so! Trad is rad. There, we’ve said it. But when trad looks this awesome, how could it be anything else? The secret to modernizing is in keeping it reeeeeeaaaaaalllllyyyyy simple. As in, try putting absolutely nothing on your woven table. See, now wasn’t that easy? A white painted pedestal table gets to play atop a round jute rug, playfully peeking out from under the chair legs. A woven tray on the tabletop and a couple of leafy stems are all you need to lure guests to this dinner-party-about-to-break-out. We fell for these chairs as soon as we saw them in the showroom. Comfy, downy-soft and just begging for a cat, a nap and a cup of tea, these are chairs that love you right back. Oh, built-in bar cabinet, how we love thee! 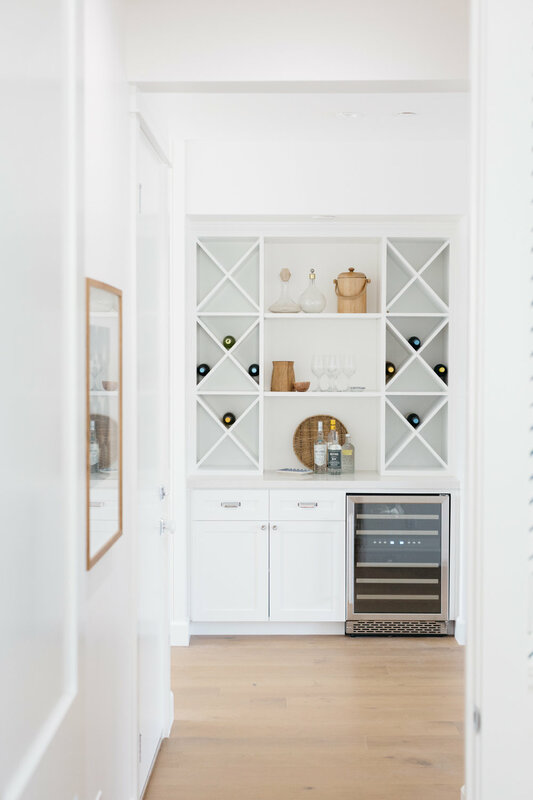 With your wine bottle cubbies and wine fridge and plenty of shelf space for all those fancy bar gadgets that we love to accumulate (what do all those gadgets do anyway?) Drinks, anyone? Oh, and, mudrooms. Don’t get us started on mudrooms. For all those dog leash, sunglass, beach hat and market basket emergencies, we feel a mudroom is now practically required in a home of a certain size. Once you have one, we’re pretty sure you’ll wonder how you ever got along without it. Ode to the home office. Serene, peaceful and motivating. A Pottery Barn chair in white linen pulls up to a campaign-style desk in weathered wood and provides a comfy place for writing, bill-paying, blogging or web browsing. Matching bookshelves offer ample space for organization at an epic level. We kept the master bedroom neutral as a respite in a blue and white home. A burlap-hued nailhead linen bed supports a plethora of pillows and wide windowpane bedding. Nightstands with a bottom shelf hold your fave bedtime read. The upstairs hallway was large enough for a console, a large pearlized mirror and a soft blue modern lamp. A wide-striped runner completes the look. A custom headboard in a Nate Berkus fabric and a vintage life preserver imbue this child’s bedroom with oodles of charm. Add a Jonathan Adler lamp, a simple basket and a stuffed white unicorn and it becomes any kid’s dream room. 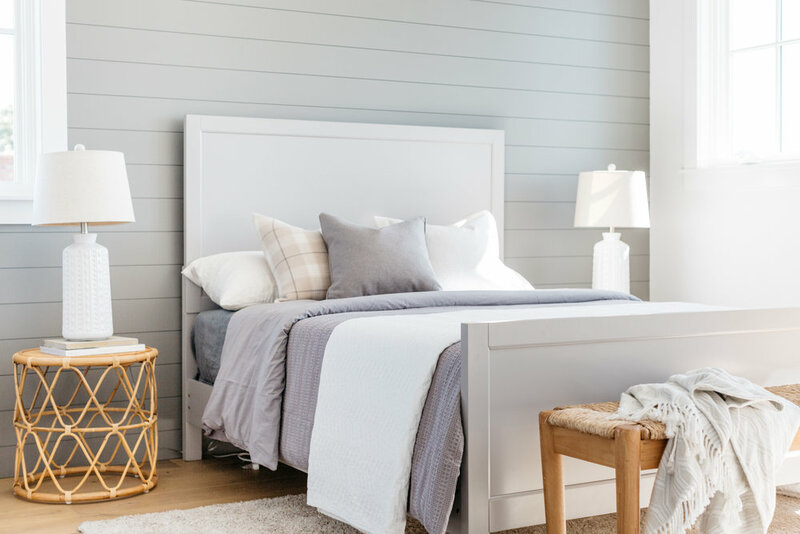 A guest bedroom reveals a gray shiplap wall, a wooden farmhouse bed and a set of rattan nightstands. A woven rush bench at the foot of the bed entices with a throw tossed casually on top. White ceramic lamps round out a basically neutral room that is anything but basic. Another child’s room is outfitted for play with woven and bamboo accents like the vintage headboard and elephant basket. Blue and white return here in the form of nightstands and bedding. White shiplap walls recall a vaguely nautical feel and an overall sense of warmth. On the other side of the room, a boho macrame wall hanging reminds us we are, in fact, in California and not Massachusetts. A built-in window seat and woven pouf bring on the charm, full force. 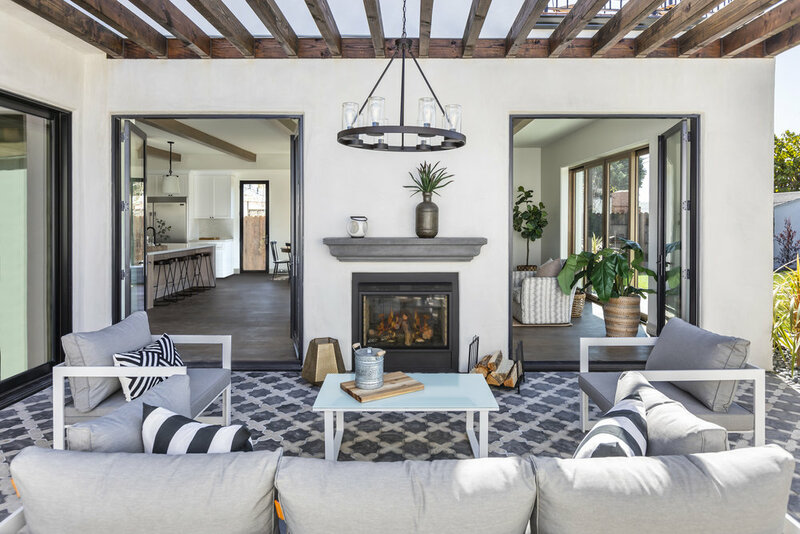 We were hired to stage a Westchester new-build spec house in a very specific style - Urban Farmhouse in the manner of Chip and Joanna Gaines of Fixer Upper and Magnolia Home fame. We squealed with delight at the prospect of stretching our pastoral muscles to envision a space that would be at once compelling, urban and contemporary, while also honoring a plain-spoken simplicity and enhancing the work of our Los Angeles developer client, Blu and White Homes. All photography by Christopher Lee. A matched set of rustic wood and linen campaign-style chairs defy any particular genre and add their unique prairie-influenced accent to the space. We love their relaxed shape and mixed-material construction. The vintage pitchfork in the background was sourced at one of our favorite salvage vendors Silverado Salvage. Our goal with this staging was to mix whimsy with a serious chill factor. So when the absolute best rustic authentic ladder presented itself at Silverado Salvage, we said, “Oh, yes!” An oversized wood-slice mirror plays along, as do wood-topped end tables and a fiddle leaf fig. A casual basket of birch logs and a filigree end table help by softening the mood and creating moments for potential buyers. Moments that speak of a blazing fire in winter, a warm cup of tea while curled up on the sofa. Ah, moments. A demijohn bottle holds a simple spray of thistle plant. Mantel decor is kept neutral with vintage books and candlesticks. A peek toward the dining room reveals a farmhouse table (here, it’s IKEA’s Morbylanga) and a set of statement-making Windsor back chairs in black. These awesome high ceilings and a wow-factor chandelier worthy of Joanna Gaines herself ensure that this dining room won’t be ignored. A soft cowhide underfoot defines the area organically. We’ve accented the table with a runner, an oversized basket and a mercury glass vase filled with eucalyptus leaves. A stack of linen napkins await a heartwarming family dinner or potluck with friends. The open staircase’s black metal railing echoes our Windsor chairs. in the foreground, a trio of Emeco counter stools soften in gray. Kitchen styling is deliberately pared-down for maximum impact. 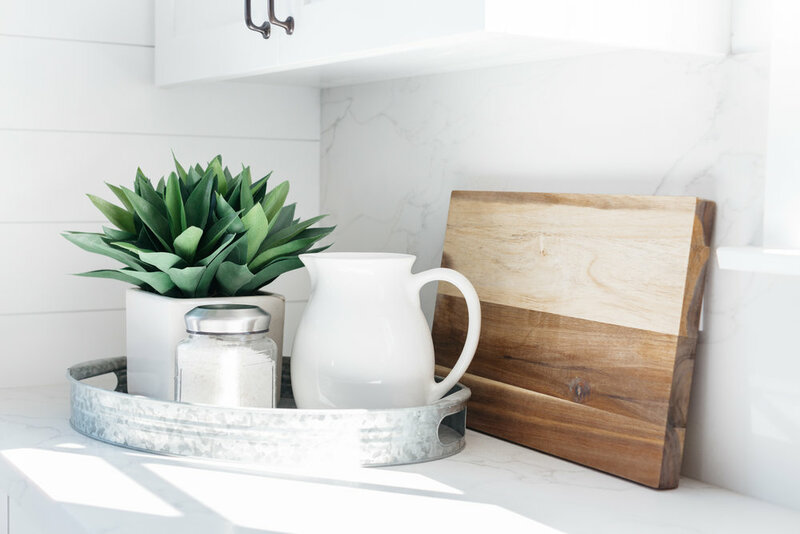 A galvanized metal tray holds a white pitcher, plant and a jar of sea salt. A rough-hewn cutting board is always at the ready for impromptu recipe-making. A vintage farmhouse ladle peeks out from behind an ironstone jar filled with wooden spoons. The all-important entry console in an industrial style holds baskets to accommodate mail, keys and a dog leash or two. A large open basket below corrals the family’s shoes and flip-flops. In the master bedroom, a grand rattan headboard holds court in a neutral color scheme under an oversized leather mirror from West Elm. Ample nightstands serve as individual dressers whose surfaces hold your latest bedtime read as well as double gourd lamps in a fresh white. We love styling beds in crisp white linens, with soft ticking stripes and a touch of gray. We are officially obsessed with staging bedrooms with dual twin beds, and we take every available opportunity to do so. When you have these awesome vintage headboards, how can you not? Fresh B&W buffalo check pillows are tempered with moss green accents and a ‘lil fiddle leaf fig. A globally influenced round table brings an organic touch to the room and pairs well with the rattan tones. 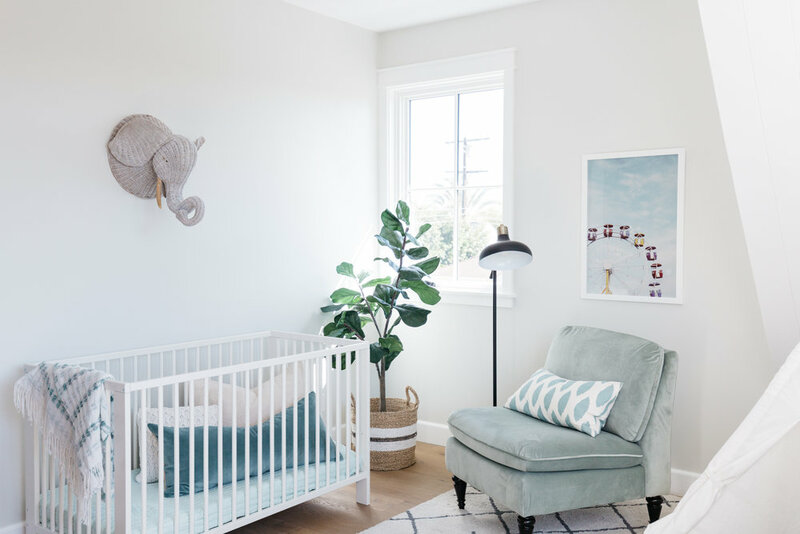 This soft, gender-neutral nursery invites play and comfort with its light, bright vibe. A print from Juniper Print Shop injects a little whimsy. 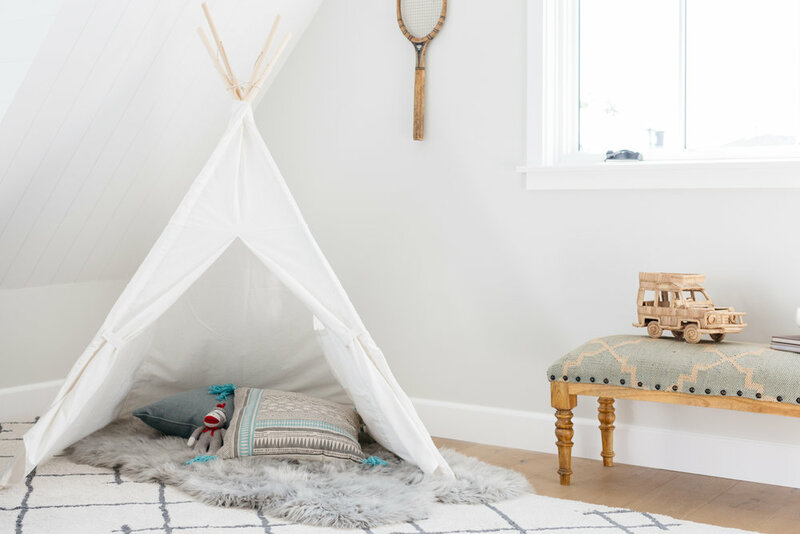 When presented with an ideal nursery corner, always, always, always add a teepee! We found this simple white linen teepee on Amazon, and paired it with a soft aqua kilim bench and a few toss pillows on a sheepskin. For your adult guests, treat them to this soothing guest bedroom with a tufted linen bed and organic tones. We’ve repeated certain colors and textures throughout the home — like basketweave — to create a cohesive feeling. A gray and white tribal textural rug warms the toes upon rising from this sweet spot. Creating a Personal Workspace: "Every Detail Matters and Each One Should Spark Joy"
When one finally makes the decision to create a space for their creative work that speaks to them deeply, it’s as if all manner of inspiration practically floats down from above. 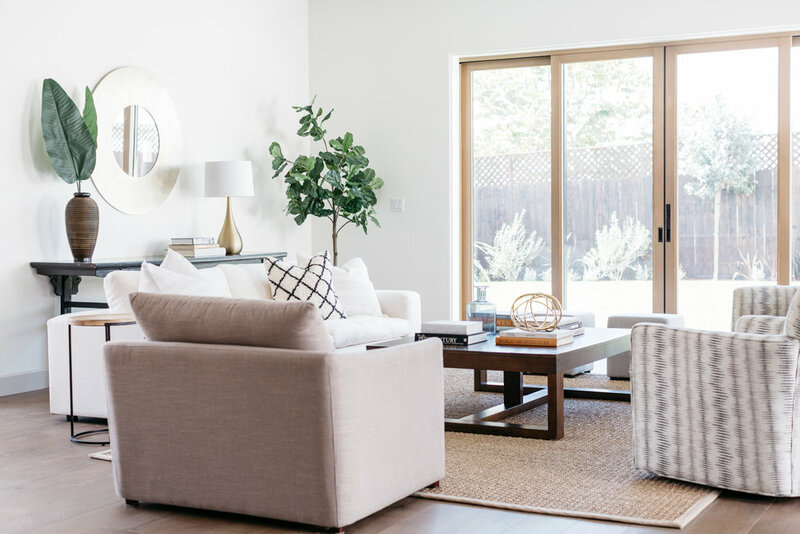 In the case of the home office of our company’s owner Robin DeCapua, that space was located in her Glendale, CA home, and — as you can see from the photo below — was in serious need of a top-to-toe makeover. BEFORE - A lackluster space with no style, limited functionality and a depressing vibe, to say the least! Enter an inspiration photo (below), possessing all the qualities desired — light, drama, blue grasscloth, red accents and a mix of styles simultaneously serious and playful. Also, quite different from your average office. Image source: Heather Scott Home & Design. So, armed with this truly inspiring image (and already possessing a red vintage Asian armoire), Robin set out to apply her personal stamp on this design. First Step: Denim blue grasscloth from Astek wall coverings. Covering the walls in something sensual and textural makes any time spent working feel more cozy and, well, less like work! Second Step: Install a dramatic light fixture similar to the inspiration photo, but still affordable. Modway’s Serge Mouille-inspired fixture was the perfect solution. Then it’s simply a matter of bringing in elements that speak to both the vintage and modern aspects of the overall design: A Mid Century modern chair “stolen” from the living room, West Elm’s yummy red and blue medallion rug, curtain panels from IKEA that complement the textural blue walls without competing and a personal favorite framed image — San Francisco’s iconic Sutro Baths. The antique Asian armoire holds all the less attractive office-y papers, while offering ample opportunity to style its top with design books and favorite objects. Our philosophy when designing for our own homes is to include only those things that literally make you smile when you look at them. The burlwood veneer desk is from Wisteria, the gray desk chair was found on Amazon, the foo dog is a now-discontinued Pier One find and the lamp is from Target. 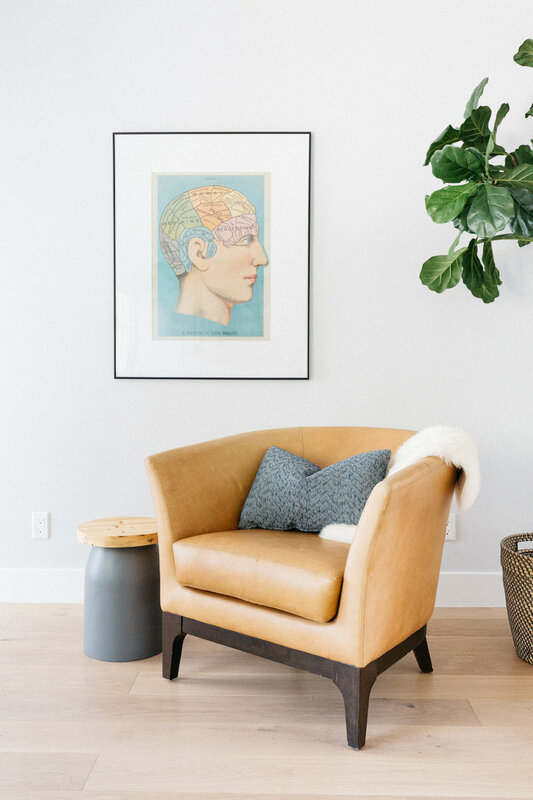 A faux fiddle leaf fig fills a corner. The vintage Italian brass fly is a gift from a dear friend. We love how the chippy, old texture and hand-painted finish of the Asian armoire looks against the grasscloth. In a personal workspace, every detail matters — And each one should spark joy. For our most recent Planet Home Living small-lot residential development project located in North Hollywood, CA's hip Arts District (NoHo), we dipped into the 1980s -- and drew inspiration from the Italian post-modernists. We wanted to play with a new box of crayons and we absolutely love the muted tones and Art Deco shapes we're seeing lately. Photos by Christopher Lee. Minimalism, matte black finishes, concrete, russet, olive green and blush all had a say in this home's design. The living room's centerpiece, a sofa from Article, opens the door to our soft pastel scheme. An amazing Crate and Barrel rug with graphite stripes lays down a simple base for khaki green chairs from Urban Outfitters and rust-tone pillows from West Elm. A little blush goes a long way. Here, it's as light as a kiss. The Cobra lamp from France & Son brings a hit of danger to the space with its stealthy darkness and sinuous shape. We like adding the tension of an unexpected piece to each room. A look into the dining room and kitchen reveals more matte black in the Serge Mouille-style lighting fixture and counter stools. In the foreground, a Blu Dot smoked-glass coffee table brings in a moody feel. The undisputed star of the dining room is a large art piece from German textile artist Meike Legler. The subtle color palette of the fabric piece brings out the aloe-green chairs from Article. Living Spaces' industrial dining table completes our matte black metal theme. Simplicity is sometimes the most elegant solution. Here, Urban Outfitters' concrete side table lends heft next to the sofa. A pale terracotta pillow ties into a hit of peach in the small potted succulent. Proof positive that a fiddle-leaf fig looks good everywhere! Graphic, bold, simple. These adjectives all describe the counter stools we found at Industry West, one of our fave stores for bar stools. We brought in natural bamboo, white and blush rose accents. Fresh white pendants over the kitchen island. A refreshing mix adding contrast. In the master bedroom, an Art Deco-influenced bed adds height and drama. Millennial Pink counterpoise lamps with marble bases tie-in to the pink tones of the Meike Legler art and throw pillow. This quiet moment in a corner of the master bedroom brought to you by CB2 and Structube. We fell in love with CB2's Antonio Acrylic Chair at first sight and when we spied Structube's tomato red ottoman, we knew these were a match made in heaven. Just add a print from Jenny's Print Shop and a subtly-patterned World Market rug. Meike Legler's pale pastel art is made up of pieces of fabric stitched together. It makes a strong statement here, but with a soft speaking voice. We simply love how well it plays with our color story here. We love bathrooms with tile all the way to the ceiling. And when you add an awesome pendant light and double-tall mirrors, well, all the better. With a home office this flippin' cute you might never get any work done. But you'll sure have fun looking around. We'd been wanting to put a Stendig calendar into a home staging project for-EV-er, and finally we got to. 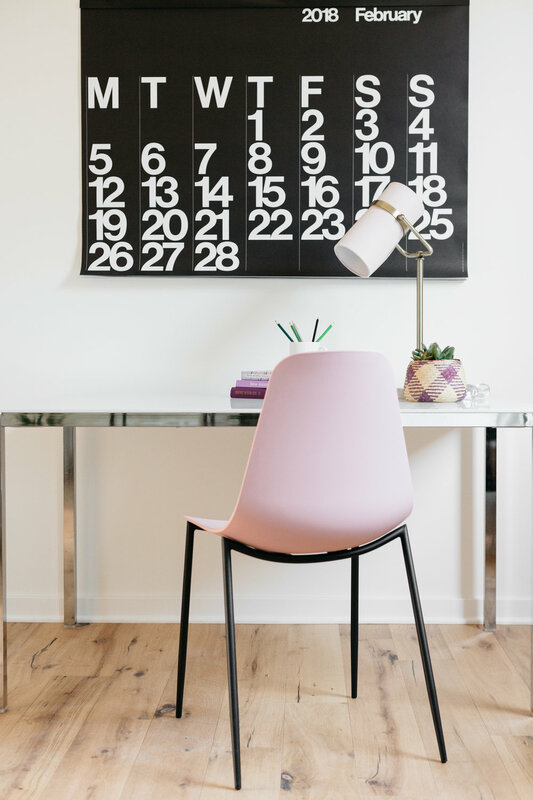 Love how Article's blush chair looks here too with the surprisingly chic IKEA Torsby desk. 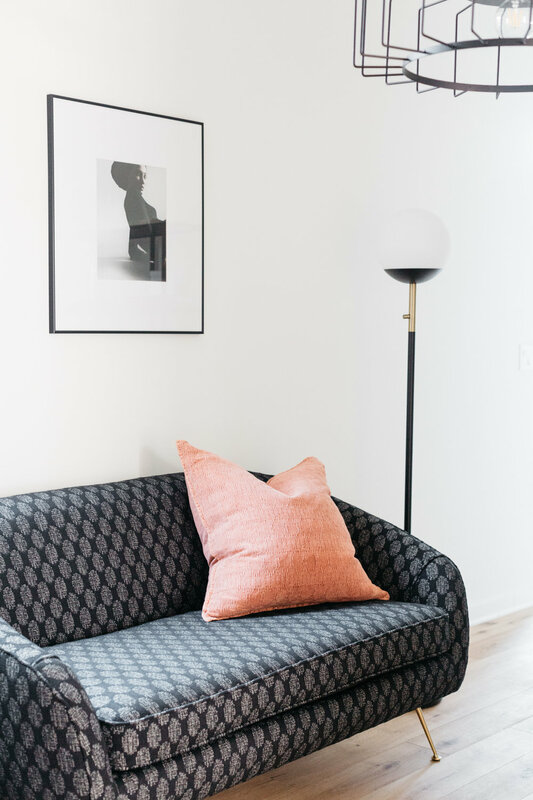 A cozy settee from West Elm on the opposite wall of the home office wears a chic patterned fabric. A simple black and chrome globe lamp and a framed fashion print taken from a coffee table photography book complete the look. CB2 has really embraced this whole 1980s Post Modernist thing and we embrace CB2 (big hugs!) for creating the Azalea Moon Chair. A dragon plant in a rounded ceramic vessel and a few office necessities on a matte black bookcase make this one cool corner. 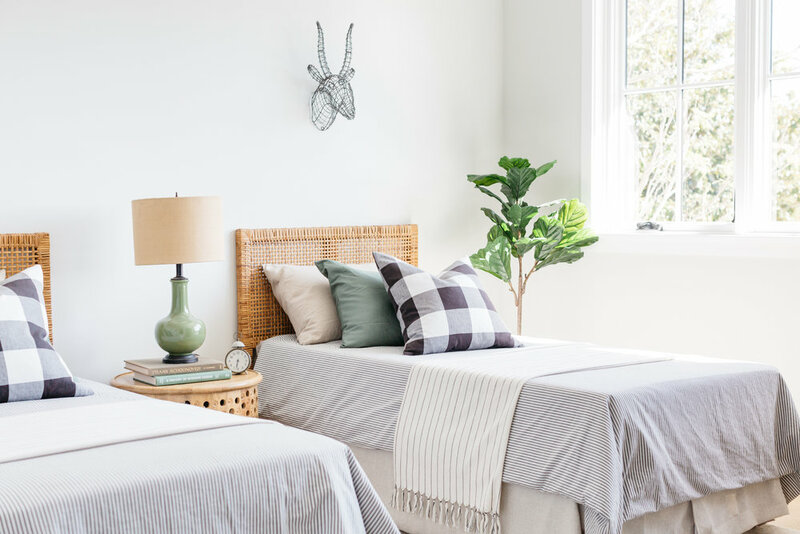 A guest bedroom steals the show with oversized chrome mushroom lamps and Urban Outfitters' cuter-than-cute Art Deco-style nightstands. Another Jenny's Print Shop original in a fresh white frame finishes it out. A pair of Mid Century modern chairs (a Coaster Furniture repro of West Elm's Show Wood chair) stand up to a modern gray sofa and a Room + Board credenza. A large B&W framed sailboat print commands a large wall while a kilim pouf sits on a neutral rug. We love the posters we find at Paper Source -- and the price (about $4 each!) -- and we have several we've gotten framed. This cheeky fellow presides over a corner in the living room, sharing space with West Elm's caramel leather side chair. When in doubt over what else to fill a corner? We always answer that question with the words "Fiddle leaf fig tree!" A side table gets our signature stack of books -- with a Japanese iron teapot perched on top. A simple geometric dot pattern rug creates interest on the floor without overwhelming the room with color. Blue pillows echo the art, a vintage print found at a thrift shop. A weathered wood dining table shares space with a set of six modern chairs with metal bases from Living Spaces. We like to keep decor simple in dining rooms, so a tall vase with foliage, a rustic wooden bowl and some brass urchin objects are all we needed. Tucked under the kitchen island are CB2's industrial metal counter stools. It's all in the details. In a bedroom, a dresser top is treated to a coastal style vase and simple foliage stop a stack of books -- with some beads thrown in. It all sits in an unfinished wooden tray. We've had ample opportunity lately to stage on LA's fabled Westside. Here, a modern architectural home gets our signature fresh coastal mod treatment. Target's Project 62 Esters chair and RUGs USA's Moroccan shag rug saved the day. A collection of blue batik and unique print pillows, sculptural baskets and vases and lots of plants set the scene for some serious beachside relaxation. There's nothing this oversize coffee table can't do -- especially when you pair it with an antique demijohn and succulents planted in a concrete square. The open staircase with glass railing serves to lighten up the entire space and let in the light. Large tropical leaves soar over the living room, while in the background along a massive hallway hang multiple images from Deny Designs by artist Viviana Gonzalez. For instant MCM cred, just add an Eames reproduction lounge chair and ottoman. This corner accommodates both, along with a brass floor lamp from Target and a tie-dye pillow found on etsy. Project 62, we love you! This new target line has produced some of our fave pieces of furniture in 2017. These tweedy gray Mid Century chairs are no exception. And Living Spaces' Alton 90" dining table fills out this overscale dining room just fine. World Market makes the faux fiddle leaf fig and the basket is from Home Goods. IKEA sells our fave cowhide rugs, which have become a part of our signature look. If you ever see two vintage twin headboards as nice as these, we have two words for you: Buy them. Do not hesitate. We did. Target's brass round mirrors accent this room dressed in Millennial Pink and dark gray. A bedroom corner sports a dark gray MCM style chair (a knockoff of West Elm's popular Show Wood chair) with a darker dusty pink pillow and cute kilim footstool. Underfoot, a shaggy white rug for purity and freshness. A guest bedroom is treated to a blue and white color scheme, with a Moroccan white shag. 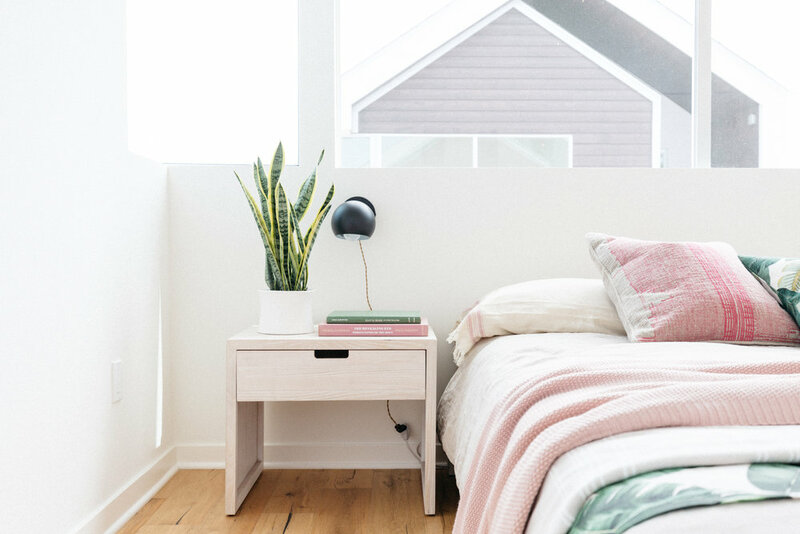 Living Spaces makes the adorable nightstands and Urban Home is the source of that platform bed. 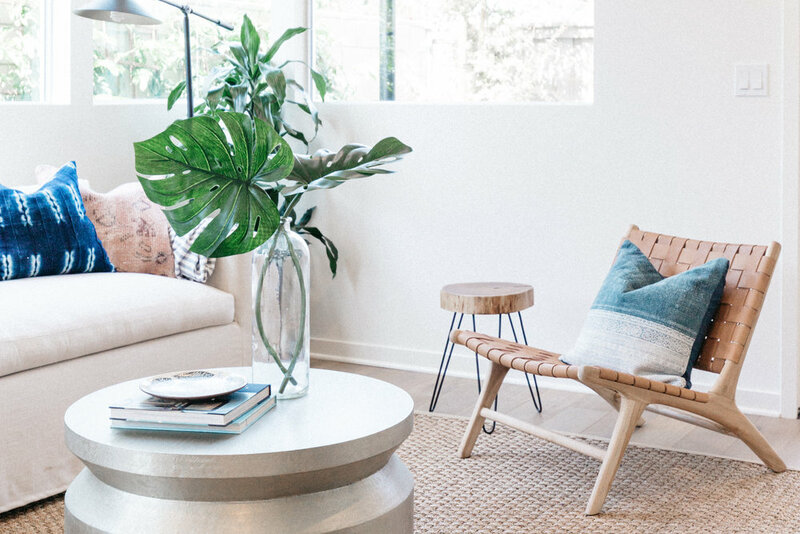 What do you get when you mix a white sectional sofa, charcoal geometric rug, a marble and brass end table, a palm tree and open white built-in shelving filled with simple clean decor? You get a whole lot of coastal awesomeness is what you get! We had fun mixing textures and soft Millennial Pink with our beachy neutrals in this room. Photography by Christopher Lee Foto. From a Danish modern horse sculpture wearing a sweater(!) to DIY B&W art, the contrast is amped up in this corner. To turn down the volume a bit, add blush pink, wood tones and textural neutrals. In the formal living room, taupe and brown take center stage around an off-white English roll-arm sofa. Adding a tall tree in a basket, an industrial-style coffee table and warm-toned books bring home the trad -- with a touch of beachy relaxation thrown in. We're huge fans of the new Target furniture and decor line, Project 62. Their take on the Millennial Pink phenomenon hits the nail on the head. These dining chairs are a knock off of a West Elm favorite -- but with the added bonus of blush pink. Just add a bowl of apples. Pantry-envy set in almost immediately as soon as we finished styling this well-appointed space. Ducks all in a row here. Not to mention olive oil. Baskets. Tins. Wine bottles. Jars and canisters of dried pasta and rice. Yes, please. Another dining space -- next to the formal living room -- picks up on brown tones with these lush Dessin Fournier velvet chairs. Keeping it simple with a highly grained wood table and striking decor. Boom. Fresh. Peeking out from the left is the (also well-appointed) butler's pantry. More DIY B&W oversized art turns up in the dining area. IKEA's (now iconic) eucalyptus leaf decor is one of our personal faves. I think we own an entire forest of the stuff and we love it for its natural look. The bedrooms were treated to a coastal blue palette because, well, beach! We love to layer textiles on beds (note the throw draped over the headboard too) for a soft and cozy feel. A fluffy Moroccan print shag rug underfoot invites bare feet to land upon awakening. Living Spaces makes the cute nightstand and Target is the source of that awesome lamp. More blue bedroom bliss. The Moroccan shag plays well with a modern upholstered bed from Living Spaces. This time, the nightstand came from Target's Threshold line and the lamp was a Home Goods find. The Room + Board credenza was a serendipitous purchase from a client anxious to downsize and the caramel leather chair came from our fave Pottery Barn/West Elm outlet store. A large framed Parisian B&W photo, a textural basket, a round mercury glass lamp and two split leaf philodendron leaves in a tall vase complete the vignette. White molded plastic Eames chairs around a World Market farmhouse table in this open-concept dining room. Cement pendants hang over a large kitchen island. A geometric wallpaper defines a built-in desk for a central homework spot or a chance to catch up on a little work from home. Room + Board's matte black coffee table is a grounding element against the rug's earthy colors. The master bedroom, with soft rose and crisp black against white linen. The Target mirror is just the dramatic energy we needed on an adjacent wall. We love using rustic ladders to hold extra textiles. The rug picks up on warm pink and taupe tones. Simple black sconces and nightstands add a touch of gravity. Linens are from H&M Home and various etsy sellers. We source from all over and reach for what catches our eye. Not ones to leave out the details, we love adding organic and earthy touches to bathrooms when staging. A peek into a guest bedroom shows one of our fave color combos: Millennial pink with tropical green -- and a fave motif, the palm leaf. A white shag rug underfoot feels cozy. Urban Outfitters makes the chair. The roofline next door creates "art" above the bed. Urban Outfitters makes the adorable gumball sconces and those nightstands are a Target Threshold item. That awesome round pink mirror? Oh yes, that's from Umbra. We collaborated with clothing designer Amuse Society to dress the studio/office space. Urban Outfitters work stools surround a John Boos bar-height work table. A World Market chair sports a cute 'lil' kilim pillow and a pink tie-dye throw from Urban Outfitters. A woven leather chair we found at Saffron + Poe lounges atop a seagrass rug. West Elm's hammered metal coffee table brings global appeal. A custom-made linen slipcovered sofa speaks beachy-fresh while inviting swimsuit-clad kids -- and even dogs -- atop its washable fabric. A tree stump side table from West Elm and a potted cactus bring the Eastside cool. Tom Dixon-style pendants oversee a white quartz-topped kitchen island. We added industrial bar stools. Outside on the patio, a living wall of herbs and greens fresh for the picking. Pier One's Eastwood dining table pairs with wishbone chairs for a global play on beach house style. Blue and white pull the look together. A view toward the kitchen reveals a blue hex tile backsplash and warm wood cabinets. Our schoolhouse-style counter stools evoke industrial charm. Details, details. Because they matter. The pillow is from Living Spaces and the side table is a Home Goods find. The master bedroom sports a mix of white and blue linen bedding from sources like H&M Home and etsy sellers. A Living Spaces trunk has a beachy weathered wood feel and a rattan lounge chair from World Market adds laid-back style. It all sits on a Moroccan shag rug from RugsUSA. 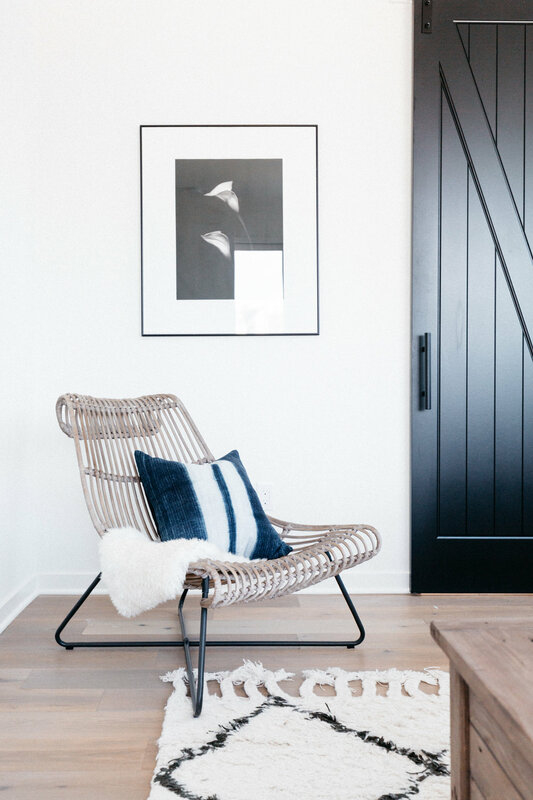 A sliding barn door telegraphs relaxed living. Recipe for success: Plants, plants and more plants. And even more plants. Did we mention that we love plants? In a guest bedroom, a blue ombre lamp from Urban Outfitters echoes a blue ombre pillow, found on etsy. We love sourcing interesting items from unlikely sources like overstock.com, site of this end table find.